Airless Towing or Hauling Support for your Truck or SUV! SumoSprings are an airless suspension enhancement that will help to maintain a level stance and reduce body roll. Custom fit for most full-size trucks. 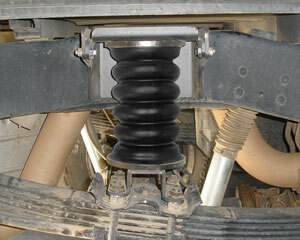 Suspension Connection is a top dealer for SumoSprings products. SumoSprings are a suspension enhancement to help stabilize your vehicle and reduce sagging due to towing or hauling a heavy load. Built from proprietary micro-cellular polyurethane foam that is leak and rupture proof and requires no inflation. All applications are custom fit, include all mounting hardware required for quick and easy install. These are very similar to a Timbren Suspension Enhancement System, but made of a different material. Front SumoSprings are ideal for trucks and suvs with snow plows, winches and heavy aftermarket bumpers. SumoSprings are designed for the front of vehicles to stabilize your front end and help to maintain a level stance. For many applications the factory bump stops are replaced with SumoSprings. Generally the SumoSpring is taller which allows them to activate sooner than your factory bump stops. Because of the progressive rate of the poly foam the variable rate springs allow up to 3,000 pounds of load capacity. These kits include all the required hardware for a quick an easy installation. Rear SumoSprings are an alternative to traditional air bags by Air Lift and Firestone. These micro-cellular springs differ in that they require no inflation and will not leak or rupture. They are able to compress 80% and stretch up to 50% of their height. While not adjustable like air bag helper springs, Sumosprings will help to reduce sway and reduce sagging in the rear end. Just mount and forget. Included with all Sumo kits are steel mounting brackets and hardware. All are custom fit for a simple installation.